After seeing several of Spike Lee's films, I've come to know just what a decent man he is. Yet, I also know that … using one of my favorite go-to-phrases … Mr. Lee “don't take NO prisoners.” In spades, if you'll excuse the expression, Spike … true to form … takes none in BLACKkKLANSMAN. In fact, racial slurs fly in Lee's new picture more profusely than bullets in any 21st-century blockbuster that might star Dwayne Johnson or Mark Wahlberg. The Lee film opens on the first anniversary of the Charlottesville, VA white supremacist rally at which a counter-demonstrator was run over and killed with a car driven by a member of the alt-right. 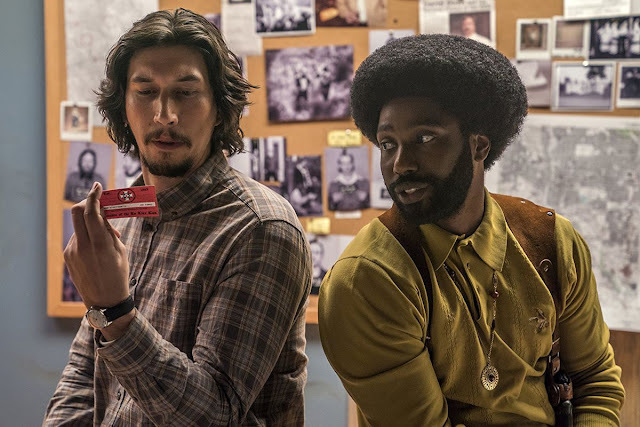 What immediately struck me was how fiction-like BLACKkKLANSMAN's script moves out, even if most of what you'll see in it is about actual events of the 70s ... and how ominously similar they are to what's going on in America as I write this and we don't have Barack Obama to “kick around” anymore. Denzil Washington's son, John David Washington, plays a wannabe cop named Ron Stallworth. Ron wants to join the Colorado Springs, CO police force. Ron shows all the makings of being a really good cop and is ultimately hired, then assigned plainclothes duty with an incredible first mission; shadowing the local Colorado Springs Klu Klux Klan. In tow with Ron is another real guy cop, Flip Zimmerman (Adam Driver). Flip fronts as the white-guy but Jewish bodily substitute to fool the Kluxers since Ron is a very black man with Afro, already. Ron does the on-phone chatting with the white supremacists “gentlemen.” The irony of this set up is almost too much to swallow as being real, but according to all accounts, that's how the crazy caper comes off. Best known for his part in the TV series THAT 70s SHOW, Topher Grace has the sweet role in Spike's flick. Topher does white supremacist and KKK klunker, David Duke, who was all in for, and on hand at the Charlottesville showdown a year ago. Duke is also a strong supporter of Donald Trump, in case you've not yet heard that “non-fake fact.” Topher appears to be just about perfect doing Duke. Near the film's open, there's a scene in which actor Corey Hawkins does a cameo of Kwame Ture … aka Stokley Carmichael. Many of his lines are quotes from the speech Carmichael gave one night back in the day in Colorado Springs. All of his words you hear seem to be about what's happening now in the United States of America. Bravo, Spike … bravo! Somebody's gotta do it!